Whether finished in brushed nickel or chrome, these oversized shower heads click through seven settings for bathers’ comfort. Users can switch through settings such as rain, massage, and water-saving modes, as well as pause mode. 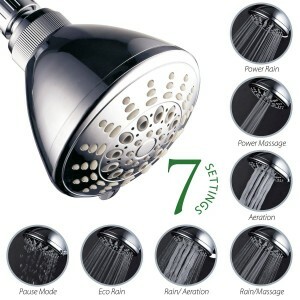 The fixed shower heads require no tools to install, and their jets can be rubbed clean.